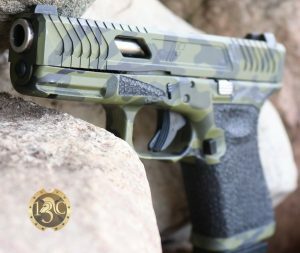 We talk with Tucker of Blackout Custom Cerakote & Force1Tactical at the Big 3 East March 2018 media event. Tucker and Joe also completely transformed my old, beat up and dingy EDC G19 into a work of art with custom paint job, Razor slide cuts, stippling and modifications to the trigger guard, magazine release and removing the finger groves as well as modifying the back of the grip and more. Tucker goes into the full details in our interview on the 13C YouTube Channel .